Please Note: The Pro 2000 is an electric toothbrush that has been launched for the EUROPEAN market. It has not officially been launched in the USA. Some sellers have imported and sold the Pro 2000 to US residents. Unknowingly, many have purchased this brush only to find the charging unit is different and does not work, out of the box within the US sockets. At the time of writing it is still be sold officially within the USA. You should consider the US launched Pro 1500 instead of the 2000. For the sake of completeness though, I will list out the differences between the 2000 and 5000. The Pro 2000 is a EUROPEAN toothbrush and comes with a 220-240v 2 pin UK bathroom or EU power adapter. The Pro 5000 is a US toothbrush and comes with a 110-130v 2 pin US power adapter. The Pro 5000 has a cleaning mode button that the 2000 does not. The Pro 2000 is slimmer and lighter than the 5000. The Pro 2000 comes with a light Blue/White handle compared to the all White of the 5000. The 5000 has a rubber grip on the rear of the handle compared to the plastic on the 2000. The Pro 5000 comes with 1 x FlossAction brush head included whereas the Pro 2000 comes with 1 x CrossAction head (in most cases). The Pro 5000 comes with a brush head storage compartment for up to 4 brush refills. The Pro 5000 has Bluetooth connectivity. The Pro 5000 has 10 days of battery life compared to the 7 of the 2000. The Pro 5000 has a more detailed battery icon than the 2000. The Pro 5000 comes supplied with a travel case. Taking into account the important information above and price the Pro 2000 is being sold for within the USA, the Pro 5000 is without question the brush to opt for. As I suggested, the US-launched Pro 1500 is the closest alternative to the EUROPEAN Pro 2000. The differences are listed out below. The Pro 1500 is a US toothbrush and comes with a 110-130v 2 pin US power adapter. The Pro 2000 comes with 2 cleaning modes, Daily Clean and Gum Care, whereas the Pro 1500 has Daily Clean and Sensitive. The Pro 1500 comes with a Lithium-Ion battery that offers 2 weeks battery life, compared to the 1 week Nickel Metal Hydride of the Pro 2000. I WILL NOW CONTINUE THE REST OF THIS ARTICLE/COMPARISON COMPARING THE PRO 1500 WITH THE PRO 5000. REVISED – Which one would we choose? The 5000 commands a sizeable premium over the 1500, but for what it offers, I think it is worth it, just. The Pro 5000 is an excellent brush that has a number of different cleaning modes a better than average box contents and features that make it a little more appealing than the 1500. Let me be clear though, the 1500 is too an excellent brush and you will not be disappointed by it. If you cannot justify the extra spend and see no value in the in box extras, then 1500 is without doubt the one to go for. The 1500 is a fantastic entry level/budget toothbrush. Ultimately they are 2 brushes that target different needs and wants so to compare the 2 is very difficult. The Pro 5000 has a cleaning mode button that the 1500 does not. The Pro 1500 is slimmer and lighter than the 5000 with a different body design. The 5000 has a rubber grip on the rear of the handle compared to the plastic on the 1500. The Pro 5000 comes with 1 x FlossAction brush head included whereas the Pro 1500 comes with 1 x CrossAction head. The Pro 5000 has 10 days of battery life compared to the 14 of the 1500. The Pro 5000 has a more detailed battery icon than the 1500. The 5000 is the more expensive. 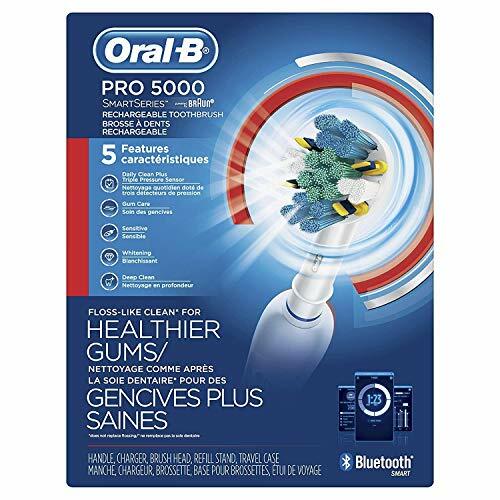 Detailed Comparison: What’s the difference between the Oral-B Pro 2000 (aka Pro 1500) and 5000? With a summary of the differences covered, let me explain some of these differences in a little more detail. Starting with what I feel to be the most obvious difference, the design. The Pro 1500 (or 2000) is slimmer than the 5000. A cylindrical design the handle is uniform in its shape, with a rubber grip running down the front of the handle and raised plastic grips on the rear. The Pro 5000 on the other hand has a more tapered design, getting thicker towards the base of the brush handle. The 1500 is all White in colour, as is the 5000, but with a few Silver accents. Larger in hand the 5000 might be more appealing to some than others. I quite like the slim profile of the 1500 (2000). Both have a power button that turns the brush on or off. This is located in the upper third of the brush handle on the front. Towards the base of the brush handle, both have battery status icons, but, the 5000’s is broken into 3 bars, giving more feedback in day to day use than the 1500. Both alert you when the battery is low. Both handles stand upright on a flat surface, but have within the base a recess that accepts the charging prong of the in box charging stand. When it comes to cleaning the teeth, the 1500 offers 2 cleaning modes. This is the default ‘Daily Clean’ and Sensitive. The 5000 on the other hand has 5 modes. They are, Daily Clean, Gum Care, Sensitive, Whitening and Deep Clean. It is the cleaning mode button that allows you to cycle through the modes. Sadly with the Pro 5000 you need to remember the order of the modes. There are no LEDs or icons to alert you to which mode you have selected. For many, the extra cleaning modes are not always required. The Daily Clean is typically fine. However, these modes do make more use of the brush motor, using varying speeds to offer a different cleaning approach. The Sensitive cleaning mode for example uses less power from the motor for a softer and more gentle cleaning experience. Inside the brush handle is a motor that allows the brush head to move. The motor in the 5000 is actually less powerful offering a maximum 8,800 oscillations and 40,000 pulsations compared to the 9,900 oscillations and 45,000 pulsations of the 1500. When used side by side, it is just about possible to tell the power difference, particularly if you know to look out for it. Both clean well irrespective of the power delivered. Impacting the clean to some degree are the brush heads. Deeper cleaning, particularly in between the teeth is achieved with the FlossAction head, whereas the CrossAction is focused more on all over cleaning. These are more choices available from Oral-B. Buy the different head styles you find work for you. The Sensitive brush head is a popular choice and recommendation amongst dentists. In fact, you can use different brush heads if you like. This is particularly effective with the 5000 and the different cleaning modes it offers. Perhaps a Sensitive brush head with the Sensitive cleaning mode and the 3D White brush head when using the Whitening mode. When you are done, the 5000 offers a brush head storage compartment to hold up to 4 heads. That compartment has a lid that protects the heads from splashes. Going against the 5000 slightly is the battery life. Its built in battery will last 10 days. Based on 1 user brushing their teeth twice a day for 2 minutes each time, the Pro 1500 lasts 14 days. However, this is perhaps a little surprising given the larger size of the brush handle of the 5000. Another difference between these 2 brushes, the Bluetooth connectivity that the 5000 offers. Using a free app available for Android and iOS you can connect the 5000 to your smartphone for real time tracking of your clean. The last major difference between these 2 models is that the Pro 5000 comes with a travel case. Fairly basic, the plastic case holds the handle and up to 2 brush heads. It is an effective way to stop the handles or heads being damaged in transit and to stop the brush accidently being switched on. If you had not already presumed, the 5000 goes come in at a premium over the 1500 for the benefits it brings. I explain this price difference in more detail, in a later section of this article labelled, is one better priced than the other? With the key differences covered, what about the ways in which they are similar. I won’t go into detail on all of these similarities, as you can read about them in the full written review that is available for each brush. Both brushes have a 2 minute timer and 30 second pacer built into the handle. A pressure sensor is available on both and activates when you brush too hard. As it activates the motor will slow until such time it is relieved. At the same time, the visible pressure sensor will be lit up. Red in colour on both brushes, the panel is at the top of the handle on the rear. A charging stand is supplied. It fits into the base of the brush handle and the brush sits upright on top. And lastly, water resistant both handles are. They can get wet and be rinsed under a tap, but do avoid prolonged exposure to water and submerging of the handle. There are so many variables when it comes to brushing the teeth, that to give a conclusive answer to this question is not really possible. To give you the most accurate information, my hands on testing would have to have been conducted in a way that could be deemed scientific of clinically accurate, but it has not been. From real world hands on use, I can say that both brushes provided a great clean to my teeth and gums. A significant speed and power increase over any manual toothbrush. You need to ensure you use the right technique with an electric toothbrush, to achieve maximum benefit, as the approach is different to that of a manual one. To my knowledge, these 2 brushes use different motors to power the brush head. The 1500 has a motor that offers up to 9,900 oscillations and 45,000 pulsations, compared to the 8,800 and 40,000 of the Pro 5000. Unless you used them side by side, you probably wouldn’t notice the difference. If you are switching from a manual toothbrush you would have nothing to compare the speed too. Existing electric toothbrush users might be a bit more sensitive to the speed and have more opinion, depending on what brush you have used previously. For most, after a couple of days use, you become familiar with the speed and think nothing of it. I personally can tell the difference if I think about it. The Pro 1500 does provide the more invigorating clean, but both did a very good job. Using the 5000 did not leave me disappointed or really wanting more from it. Long term, there may well be valid argument to say the 1500 can clean better. I wouldn’t make this the deciding factor in your choice between the 2 brushes. Both have gained the American Dental Association’s (ADA) Accepted Seal. Such accreditation is not handed out lightly, so there is a lot to be said for this. If the ADA approves them, the body who issues dental advice, what more can we ask for?! For those wishing to get more technical you need to consider the brush heads. The 1500 comes with the CrossAction head, whilst the 5000 comes with a FlossAction. Both of these heads, are from a range of interchangeable heads that work on Oral-B brush handles. Just because one style came supplied, does not mean you need to stick with it. You can choose the one you feel is most suitable for you. It is perfectly possible that 1 style of brush head can achieve better results for some than it can others. It depends on your teeth and oral health goals and how you measure the clean. 16 degree bristles found on the CrossAction brush head are designed for a solid, all over tooth clean. Irrespective of which you choose, you will likely feel and see the benefits, particularly if switching from a manual toothbrush. Used correctly you should get the thumbs up and praise from your dentist, upon your next checkup. Not that you should necessarily judge a toothbrush on price alone, but yes, the Pro 1500 will be cheaper than the Pro 5000. If you find the Pro 5000 cheaper than the 1500, question why. $70 is the suggested selling price of the 1500, but at the time of writing, sold exclusively through Amazon, you can generally purchase it for around $60 or just under, so a small saving. The more feature rich Pro 5000 has a suggested retail price of $130-160. The 5000 rarely sells at this price. My research has shown that it typically hovers around $100, sometimes a little higher, but quite often below. Prices of course vary from one store to another, but it’s not impossible to get the 5000 for $85 if you time it right. Manage to get the 5000 at $85 and for roughly $25 more than the 1500, you are getting quite a bit extra. This is of course my opinion. Whatever you decide, do so taking into account what you can afford, are prepared to spend and need. Make sure you buy the best brush for you, be that either of these or a completely different brush. As a guideline, if you can’t find the Pro 5000 for less than $110, either go for the 1500 or consider other options. Buy the brush that is right for you. Technically and based on box contents the Pro 5000 is the better brush. It delivers more power, more cleaning modes, has Bluetooth, a brush head storage compartment and a travel case. This all comes at a price though. The 1500 is the more cost effective option, but still does a great job of cleaning the teeth. Direct head to head comparisons like this are hard to conclude fairly, as your needs and wants from an electric toothbrush are different to somebody else. If you want the better of the 2 brushes, the 5000 is the one to go for. Want the absolute best value for your money then the Pro 1500 is the one. Feel like you are stuck somewhere in the middle? Then the 5000 is likely the better investment. Over the several years of ownership the cost difference is small, but you might find you get real value from the benefits the 5000 brings. Oh, and remember, as a US resident, the Pro 2000 is not the brush to buy!